Taking place on April 5 2019 at Sydney’s Centennial Hall, Town Hall, AdNews Agency of the Year also features fewer categories. Instead of labouring over more than 30 categories in a marathon ceremony, we have slashed the count to 20 entered and two chosen categories (see below for a complete list of the overhauled awards). Deadline for all other categories closed yesterday. Meanwhile, the new event format has been designed to bring all of those working across adland together for a night of celebration, where several special lights will be shone on companies, individuals and of course, the work itself. At 5:30pm, doors will open to the entire industry and we will hand out four very special awards: Emerging Leader of the Year; AdNews Hall of Fame; Employer of the Year and of course, AdNews Agency of the Year. To bring life and celebration to our party we are striking deals with seven special partners to deliver activations at the evening party. Be prepared to have the night of your life. Tickets are priced at a reasonable $139.00 each. This year's AdNews Agency of the Year Awards will be delivered in conjuction with our incredible partners: platinum sponsor Snapchat, gold sponsor Goat, silver sponsor Val Morgan and bronze sponsors AdStream, BlueStarWeb and Wink Models. Want to come on board as an AdNews Agency of the Year partner? Email our events BDM Amanda Wilson. 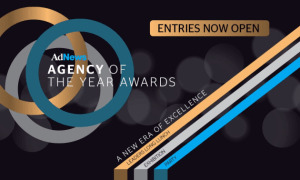 AdNews Agency of the Year Awards is extending the deadline for the Media Agency of the Year and Media Campaign of the Year categories as a way to ensure we deliver the broadest, most inclusive awards program across Australian adland in 2019. In recognition of the year-long awards hiatus imposed by several major agency networks in March 2018, we have extended our current deadline to March 8 2019 at 1pm, therefore giving all parties the opportunity to shine a light on their incredible 2018 endeavours. It is hoped that the extension will allow the entire readership to re-engage with AdNews Agency of The Year Awards in the same positive, forward-looking and inclusive manner in which they have been devised. The changes to this year's AdNews Agency of the Year Awards are far-reaching - beyond just strengthening our criteria, and eschew the formats typically rolled out by industry press. For example, the judges selected are purely client-side (with the exception of the PR category) - some 130 brand CMOs will take part in live judging for the first time ever - and behind-the-scenes fact checking will be undertaken by AdNews as entries come in.